Property Location Located in Oglesby, Brightwood Inn Country Inn is in a state park and close to Deer Park Country Club and Dickinson House. 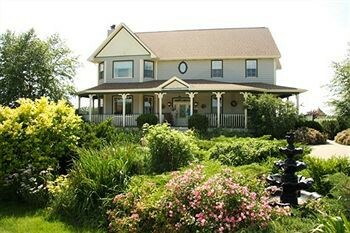 This bed & breakfast is within the vicinity of Starved Rock State Park and Illinois Valley Community College.Rooms Treat yourself to a stay in one of the 8 guestrooms, featuring fireplaces. Satellite programming along with DVD players are provided for your entertainment.Rec, Spa, Premium Amenities Take in the views from a garden and make use of amenities such as complimentary wireless Internet access and an arcade/game room. Additional features include gift shops/newsstands and wedding services.Dining Enjoy a satisfying meal at a restaurant serving guests of Brightwood Inn Country Inn. A complimentary continental breakfast is included.Business, Other Amenities Featured amenities include a library and coffee/tea in the lobby. Free self parking is available onsite.